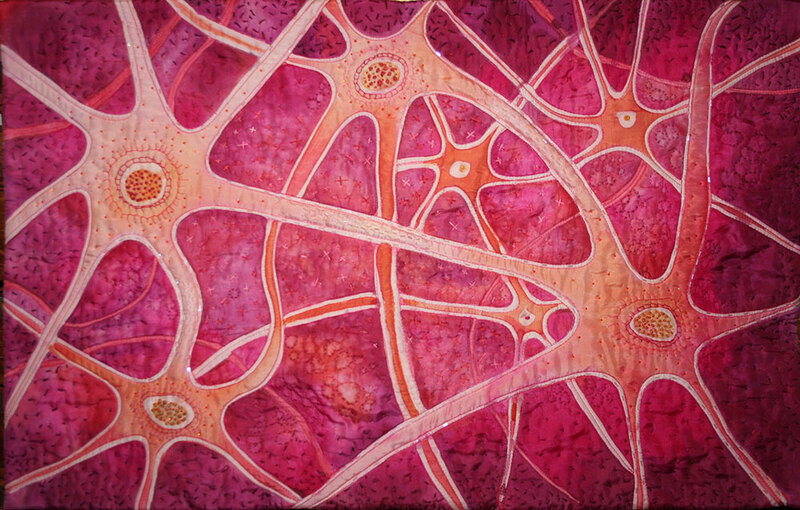 “Synapse” 20″x30″ hand-painted silk, hand embroidered and beaded. This is a wholecloth quilt. I used Jaquard Green Label silk dyes with the serti resist method to paint this 20″ by 30″ piece of china silk. 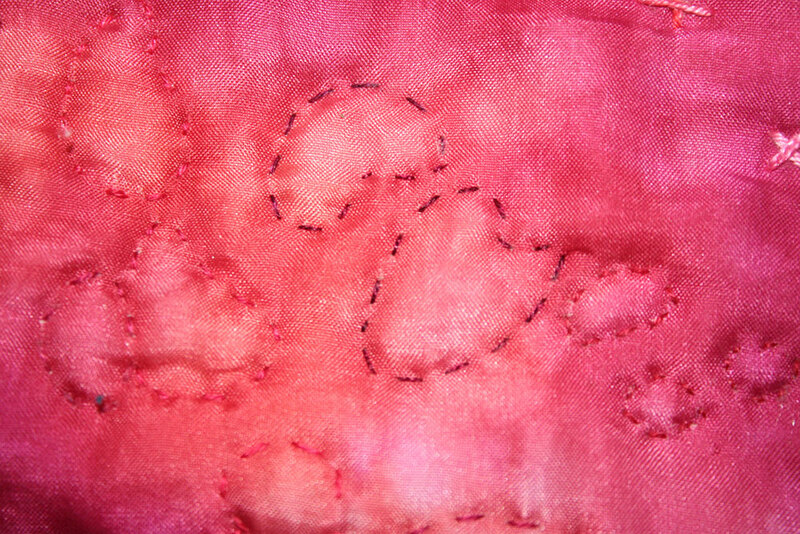 I machine quilted along the cell walls and dendrites. I embellished by hand with silk floss and glass beads. The brain has trillions of synapses. At synapses, neurons release neurotransmitters that are picked up by their neighbors, carrying signals from cell to cell. These signals form memories and thoughts. The long, branchlike projections of brain cells are called axons and dendrites. These projections carry synaptic messages, integrating all the information a cell receives. Intelligence is dictated by a brain’s underlying organization and molecular activity at its synapses. Damage to dendrites is associated with depression and despair. Alzheimer’s disease disrupts both the way electrical charges travel within cells and the activity of neurotransmitters between cells. 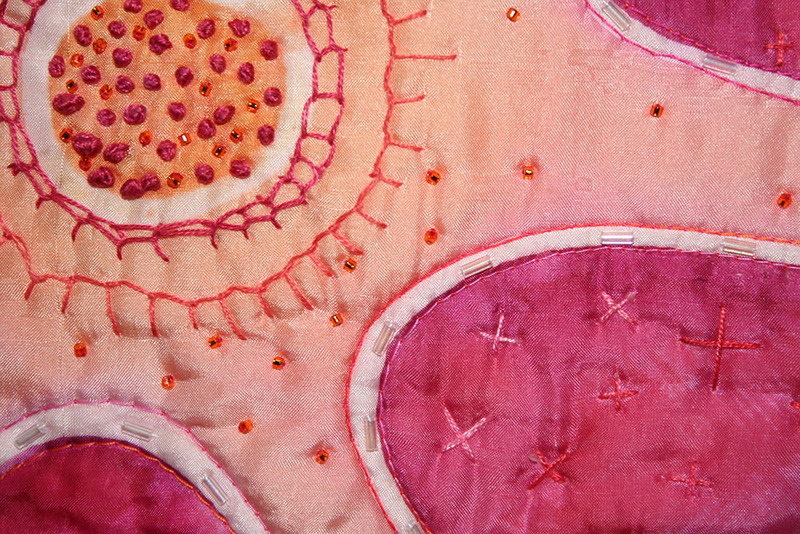 This entry was posted in art quilt, surface design. Bookmark the permalink.